The term overfishing refers to the practice of catching so many fish that the ability of the fish to sustain itself is in jeopardy. This can result from catching too many parent fish which prevents ample breeding from taking place. It can also result from just catching too many of the species until they are completely gone. British overfishing of cod in Icelandic waters. The ensuing argument between the British and the Icelandic became known as the "Cod War." A ban for foreign fishing within a 100-mile zone has helped cod to breed and exist in greater numbers now, although they have never recovered to the numbers that existed prior to the 1970's when the Cod War occurred. Bluefin tuna, primarily in the Mediterranean but elsewhere as well; this fish is slow to breed and has declined in great numbers since the 1970's when industrialized fishing became most prevalent. Dolphins were victims of overfishing, accidentally, when they were becoming caught by tuna fishers. More recently, dolphins have increased in number after media attention and dolphin safe stamps were applied to tuna cans of fishers that used sustainable, dolphin-friendly practices. Sharks, rays and turtles are three more species that have been victims of overfishing as a result of poor methods used by tuna fishermen that lure these species as well. The overfishing of herring resulted in ill effects on cod because herring are cod's primary prey. Krill, which are small shrimp, seemed to be in abundance in the ocean. However, several countries have started harvesting large amounts of krill in the last several decades. As a result, the krill population itself is not yet endangered necessarily, but the lives of those who eat it, such as seals, penguins, squid and fish, may be negatively effected by the harvesting. The Bering Sea's king crab population is overfished. 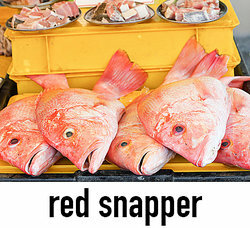 A study completed in 1997 revealed that red snapper was being overfished in the Gulf of Mexico. In 1992 it was found that there were no remaining cod in Newfoundland due to overfishing. Holothurians in the Indo-Pacific have been overfished particularly sandfish and teatfish. Marlin, skate, flounder, and halibut are also fish that have been overfished. The cause of overfishing is largely due to the large number of commercial fishing fleets and the methods of fishing which are making it impossible for the ocean to sustain the existence of fish in these fishing areas. As a result of commercial overfishing, some species are extinct or approaching extinction. The solution to overfishing is to stop poor fishing practices and to better monitor exploited populations of fish. Individuals can help by remaining informed on overfishing and supporting sustainable practices, namely by purchasing fish that have been sourced in a sustainable fashion. Overfishing is a "Tragedy of the Commons" problem. It is better for each individual person to overfish to benefit himself but it would be better for all the fisherman collectively if everyone refrained from overfishing to sustain the population. "Examples of Overfishing." YourDictionary, n.d. Web. 23 April 2019. <https://examples.yourdictionary.com/examples-of-overfishing.html>.